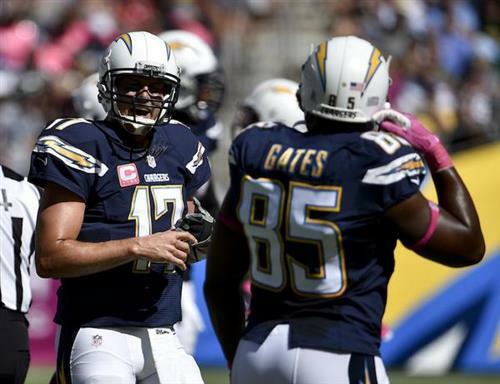 Philip RIvers' first interception since second quarter of season opener. Went 128 passes without one. Philip Rivers got a little greedy there. Threw into double coverage to Keenan Allen, Jets' CB Philip Adams with the INT in end zone. First interception Philip Rivers has thrown since season-opening loss at Arizona. A fine ball don't lie moment in Chargers/Jets. Rivers was just being smart with that INT. He knows bad things happen when the Jets have the ball. Clear fumble. This crap officiating crew will probably overturn it because they're garbage. Looked like Jarrett Johnson or Ricardo Mathews caused the Chris Johnson fumble. Jahleel Addae recovered. It's under replay review. If there is a stat that indicates difference in effectiveness of #Chargers D this year, it's their seven takeaways. Had 17 all last year. RT @UTgehlken : Chargers LB Jarret Johnson having right ankle taped on sideline. Been playing at high level. > He's jogging good on sideline. I was wondering why they didn't accept the penalty, but then they did. That'll do. Chargers have done a better job forcing fumbles on D, but their fumble recovery luck this season has been amazing. Chargers can now get a 1st down at the 5. Gotta think that's when they accepted the penalty rather than the gain. Costly penalty by #Chargers rookie Chris Watt nullifies TD and now it's 1st and goal from the 17. Chris Watt got a little too barnacly, negating the Ladarius Green TD catch. No flags on that play, huh? Rivers got wind knocked out of him. Not for first time this season. He keeps praising the protection, but he's actually taken some big hits. What's the flag this time? They have been atrocious. RT @sdutPosner : And CBS with no replay of what looked to be DPI. I take back my praise of this crew from earlier. I hope Antonio Gates didn't bench himself in his fantasy league like Larry Donnell did last week. I'm about ready to mute my television. These guys are horrible. Philip Rivers to Antonio Gates is apparently unstoppable. Both look phenomenal today. Love it! I'm thinking no. RT @NickNRickShep : These announcers have seen football before? It's a good thing Philip Rivers is tough because he's getting hammered. This is first time since 2010 that Antonio Gates has had more than one multiple-TD game in a season. Uh oh. RT @UTgehlken : Mike McCoy sat beside QB Philip Rivers and spoke to him. Kellen Clemens warming up on Chargers sideline. I liked Trent Green on the radio. Is there something about being on TV that just kills brain cells or what? If I was a back-up QB, I just start randomly warming up on the sideline to mess with everyone's head. RT @UTgehlken : Donald Brown headed to locker room ... Didn't play after unnecessary roughness penalty. >Branden Oliver ready for more work. Philip RIvers is back standing in his cusomary spot on sideline watching Chargers defense. Eddie Royal hugged Philip Rivers as QB took field to start drive. Jets have 51 total yards, zero points. Mike Vick time?